[PS4] OPE OF - Sep 16 Update Out Now! What leagues will you included this year? Will the OP be released with 1024x1024 kits? Last year i had trouble when the space for kits were full. Thanks for all your hard work, it is people like you that make this game special. For now, my plans include the Bundesliga and Other European Teams. Looking forward, I'm not sure of my next project but will keep everyone posted in this thread. For now, kits are 2048. But once PES World release their kits for Bundesliga, Serie B, etc, I will look at reducing the size to 1024. Thanks so much for the kind words, btw. great work on the option file. had a few issues with certain images for teams not transferring, like Eibar and Le Harve from usb key ? have you had similar issues ??? Sometimes, I think the game doesn't like it when you try to import so much data in one go. If you're still having issues, I'd recommend trying importing one league at a time. Dunno if anyone is interested but I am doing a rough build of the older default ml team, castolo etc they are gonna be far from perfect face wise but hopefully similar enough for a bit of nostalgia. When I get it done would anyone like it? Making them over fineeesberg in other euro teams. I've already dome them mate. Feel free to carry on but also feel free to download from to save time. Check my twitter feed, it's all I bang on about. I'll have the team full finished by the end of the weekend. 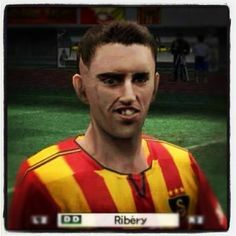 I'll recreate all the PES 5/6 players. I'll create my own thread on here soon. Let's not highjack Mike's. I've also re-worked all player stats for the Bundesliga. Super work. I shall give it a go before work. *Edit* Well, when its up! I'l llook at releasing the next update tomorrow. Got a really busy week ahead; working today and tomorrow, football on Monday, moving house on Tuesday and then I'm off to Belarus on Wednesday for Europa League duty! When you're finished, please feel free to post up your list and I'll get everything added in for the next update. Will do. I have it all saved on a text document. Problem is im working tonight! Should have it finished Sunday/Monday. That's fine. Not sure when my next editing session will be, however, all corrections will be included in the final release (once all OET clubs are created). Yeah that worked just did individual updates for each leagues from USB, cheers. When completed can I "apply live update" as when I was playing champions league player rosters weren't updated. Just want to check as it will overwrite edit data, don't want it to mess up your edit ? When completed can I "apply live update" as when I was playing champions league player rosters weren't updated. Unlike last year, edited squads are left untouched when you update transfers via Apply Live Update.